In Numbers 15:37-41, Adonai instructs Moses to speak to the Israelites and tell them to make tassels (tzitzit in Hebrew) on the four corners of their garments to look at and so remember to obey all the Lord's commands. Because they were hanging in full view on the four corners of the garment, these tassels or fringes were a constant reminder to be consecrated to God. The command to wear tzitzit only applies to four-cornered garments, which were common in biblical times but are not common anymore. To fulfill this command, there is now available a four-cornered garment called a talit or prayer shawl, which is worn at various times, especially during prayer. Baruch atah Adonai eloheinu melech ha'olam asher kid'shanu b'mitvotav v'tzivanu l'hitatef batzitzit. 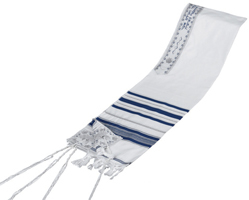 Blessed are You Lord, our God, King of the universe, Who made us holy with His commandments and commanded us to wear the tzitzit. Mezuzah measures approx. 5.5" tall and 1" wide.